On Sunday, April 8, Jason Schnur ran the Credit Union Cherry Blossom Ten Mile Run in support of Credit Unions For Kids and the children’s hospitals that care for his son, Zachary. Zach was diagnosed with short segment Hirschsprung disease (SSHD), a disease of the bowel, leading to two surgeries at 6 weeks old. He went home from the hospital with a colostomy bag, which collects waste rerouted from the colon. Just two weeks after the operation Zach began to flourish. He was not at all bothered by the stoma and colostomy bag and Jason and I surprised ourselves by how quickly we adjusted to managing the situation. We even started calling the exposed colon “Mr. Stoma” We tried our best to be very open about Zach’s condition and help to educate our friends and family so that they could understand and if not, feel comfortable enough to ask questions – ask away! We didn’t want this to be a secret and we certainly weren’t ashamed of our little boy’s condition. We are so proud of our little fighter. We didn’t want this to be a secret and we certainly weren’t ashamed of our little boy’s condition. The Schnurs were told Zach would be ready for his next surgery, the procedure to reconnect the healthy part of the colon, once he reached 15 lb. The arrival of that day was bittersweet. Melinda and Jason weren’t sure if they were making the right decision for their son and the family was finding it surprisingly difficult to say goodbye to “Mr. Stoma.” Fortunately, the surgery was quick and seemingly successful, until Zach began running high fevers, panting and moaning in pain. After yet another surgery and what felt like the longest day of the Schnurs’ lives, a surgeon shared the news: the reconnected area had pulled apart and his abdomen had filled with puss. His entire bowel had to be removed, cleaned and put back together. When we rounded the corner to look inside Zach was there. He was in his crib/gurney. He was intubated and bagged. I saw my limp little baby lying with a man in a mask pumping air into his lungs. We were ushered out. I became faint. This was only the beginning of our family’s journey. Following that surgery, Zach began to recover but not without his share of complications and setbacks. Each day was a landmark to celebrate and when he turned one year old, the Schnurs’ reflected on the time such a milestone was uncertain. 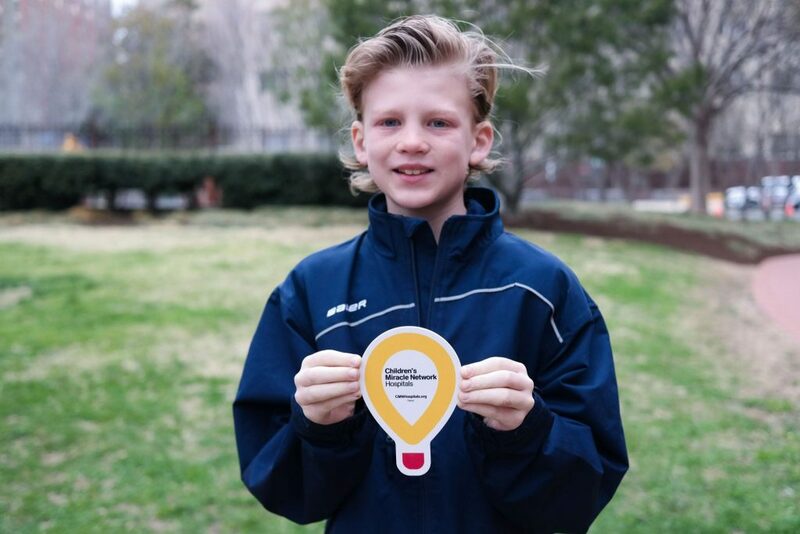 Today, Zach is a healthy, energetic 10-year-old with five surgeries under his belt. He has received care at multiple Children’s Miracle Network Hospitals including Children’s National and his parents regularly fundraise to ensure kids like him receive lifesaving treatment. 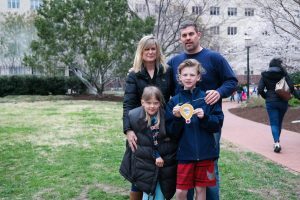 Jason and others who collect donations during the Credit Union Cherry Blossom Ten Mile Run have helped raise more than $8 million for children’s hospitals since 2002.